Fruit salad is fantastic anytime of the day and can be mixed with yoghurt, museli or served for dessert. 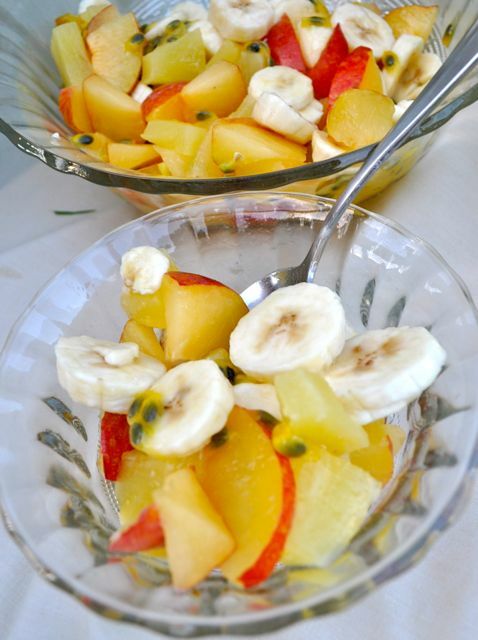 This fruit salad combines tropical flavours to remind you of summer vacation. 1.) Place the pineapple pieces in a bowl. 2.) Slice the nectarines thinly and remove pip. Place the nectarines in the bowl. 3.) Slice the banana’s thinly. Add them to the bowl. 4.) Slice the passion fruit in half and scoop the pulp into the bowl. 5.) Mix all the fruit together then sprinkle with the coconut if desired. Optional extras: Other tropical fruits such as mango, papaya, watermelon and lychee’s make a great addition to this simple fruit salad. Tinned pineapple is used in this recipe instead of fresh as there is more juice on pieces of drained, tinned pineapple than fresh. Pineapple juice coats the banana pieces and slows the oxidization process, preventing them from turning brown and soft quickly. If you do not have fresh passion fruit approximately 4 tablespoons of tinned pulp can be used.